Perhaps it’s the falling value of the pound, the looming unknowns of Brexit or the comfort and ease of coach travel… whatever the reasons, we British like the idea of taking our short breaks and holidays – especially second holidays – by coach. Almost all coach holidaymakers are set to continue doing so and a sizeable number of non-coach users expect to be trying the idea for the first time over the next few years. These are the chief findings of a substantial new poll just completed by the Coach Tourism Association (CTA) and announced recently. 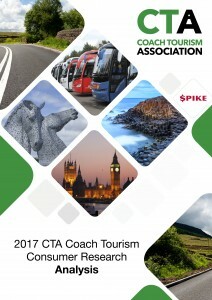 The first ever nationwide CTA Coach Tourism Survey heard the views of more than 25,000 people nationwide, almost 6,000 of them non-coach users. It found that a full 92% of those who already take coach holidays will continue to do so, while 43% of non-users (across all ages) say they are likely to try it for the first time within five years. And the chief reason given was not – as some might expect – price, but that coach holidays are so easy: they take the hassle out of travelling. Already, more than 18 million day trips are taken by coach and the CTA estimates that well over five million go on a short break or longer holiday by coach, spending £1.4 billion a year. Survey respondents say they take an average of 2.3 trips per year in the UK and 1.2 trips abroad. CTA chief executive Chris Wales said: “This is the first time we’ve conducted such a survey and the findings lay a lot of assumptions to rest. Price, for example, is not a key reason for choosing a coach holiday. The chief reasons in fact were that coach holidays take the hassle out of travel and they’re a sociable way to travel. Value for money came third and price wasn’t in the top five. “Age is another assumption. As you might expect, coach travel is most favoured by the over-65s but almost 40% of our respondents are below that age. The most favoured length of holiday is four or more nights in the UK, followed by a short break in the UK of one to three nights, and holidays abroad continue to be popular for more than half of coach passengers – encouraging at a time when Brexit, the lower value of the pound and terrorism might all be expected to cast shadows over foreign trips. The 2017 CTA Coach Tourism Survey was carried out among 25,752 UK adults – 5,870 of whom had not been on a coach holiday within the last five years – in association with SPIKE, a business consultancy specialising in the travel and leisure industry. Almost 30 organisations (coach and tour operators, tourist boards, ferry companies, relevant magazines and websites) participated by mailing the survey link to more than 500,000 email addresses. The response rate was over 5%. The Coach Tourism Association is a 300-strong membership organization, split between coach tour operators/tour wholesalers and industry suppliers. It was founded to promote travel and tourism by coach 27 years ago.